In love with Montenegro and our great hosts we decided to stay a few days longer and explore the nearby area. A trip went to Biogradska Gora National Park. It is the site of one of the last three large virgin forests in Europe. The landscape is one of mountain ridges, glacial lakes, and temperate forest. The park is quite touristy. After paying 3€, the gate is opened and you can ride into the park. The windy tarmac road ends at a bigger parking lot with a ranger station aside. Few hikers gathered at this trail starting point. We did not believe the answer after asking the ranger if we were allowed to enter the trails with our bikes. We didn't hesitate to follow his advice and jumped on the bikes to explore the park. The sheer beauty of the landscape was overwhelming. After climbing several trails, overtaking hikers here and there the ride was ended by the snow. The peaks were not passable and we decided to venture down and out of the national park. 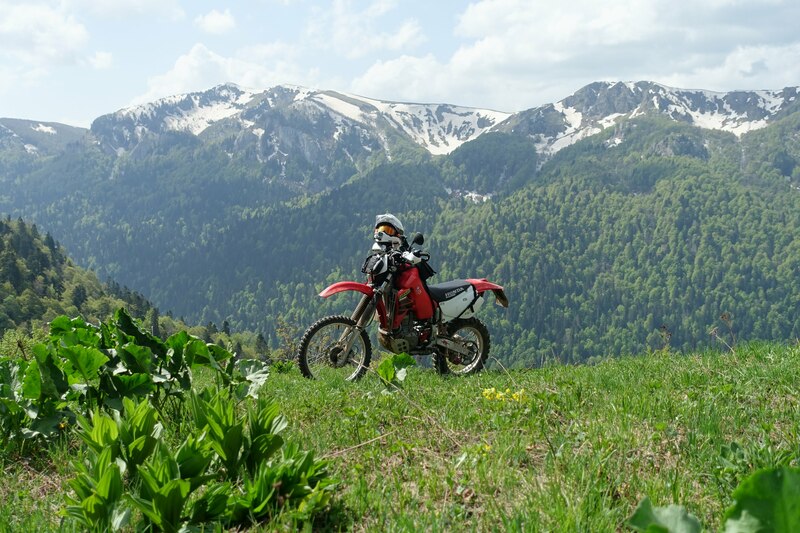 Instead, we wanted to explore the TET south of Kolasin. Lots of huge chinese construction sites had to be passed. The TET route in its original way was not passable due to construction vehicles. We tried a way around but the area was just streaked with signs of construction. The plan for this day was to reach Theth, a very old, little village in northern Albania's Shkodra region. After entering Albanian border, a whole new experience was preparing for us. After hours of braaping through awesome tarmac twisty roads and having lunch at very nice and cheap place, we continued our way towards Theth. The obligatory take a picture stops of course had to be done. The roads took us further in remote landscapes and winded up the mountains. The comfy tarmac roads were gone soon. It was already late in the day but we decided to keep going as wanted to reach Theth. It was cold up in the mountains and the snow more and more became an issue. The weather was not looking good also, thunderstorms showed up in the forecast. Let’s hurry up! Reaching the peak and highest point of the route was doable, not a lot of snow there. From here on it should be easy, just going down the east-side towards our planned destination. The scenery was breathtaking and we just had to stop here and there to soak up the landscapes. ... a few more serpentines and we landed on the ground of hard facts. We reached the point where the snow-digger stopped its work and there was just no way through 1 meter deep snow. Damn it. It was only about 5km to reach Theth from here, approx. 1km linear distance. It took us hard work, a few crashes, one injured knee and lots of sweat to return and climb up all the way. It was getting dark when we eventually found accommodation. An unforgettable night, most if it without electricity but good stories and great people followed, before I fell into my fondly prepared, pink princess bed.